In most circumstances, slave owners did all they could to deny individuality to enslaved people–omitting their surnames, refusing to recognize their marriages or identify their families. Ironically, the one time we can count on them to fully name and describe a slave as an individual is when that person has fled. In the effort to recover their “property,” slave owners were forced to provide all the information they had, from name to appearance to (in some cases) talents and personality. So here are the ads for everyone known to have run away from Roderick McGregor’s place. 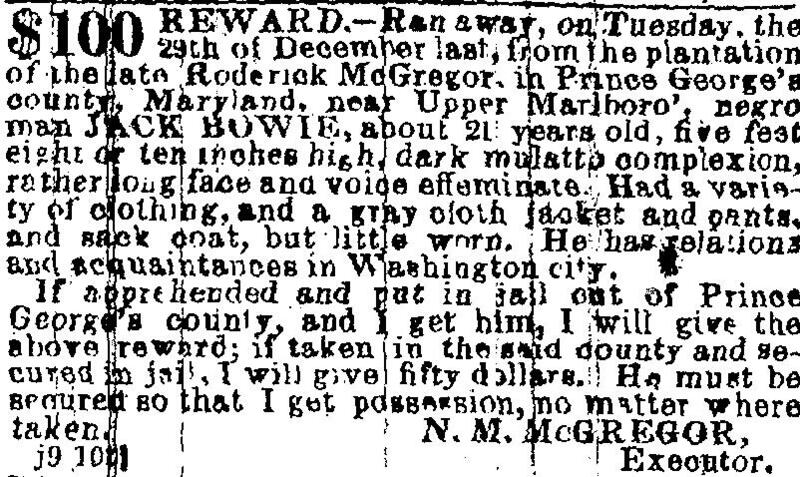 For many more ads, from an earlier period, I highly recommend Runaway Slave Advertisements: A Documentary History from the 1730s to 1790. Vol, 2: Maryland. Compiled by Lathan A. Windley. Westport, CT: Greenwood Press, n.d. Reprinted from 1983 edition. 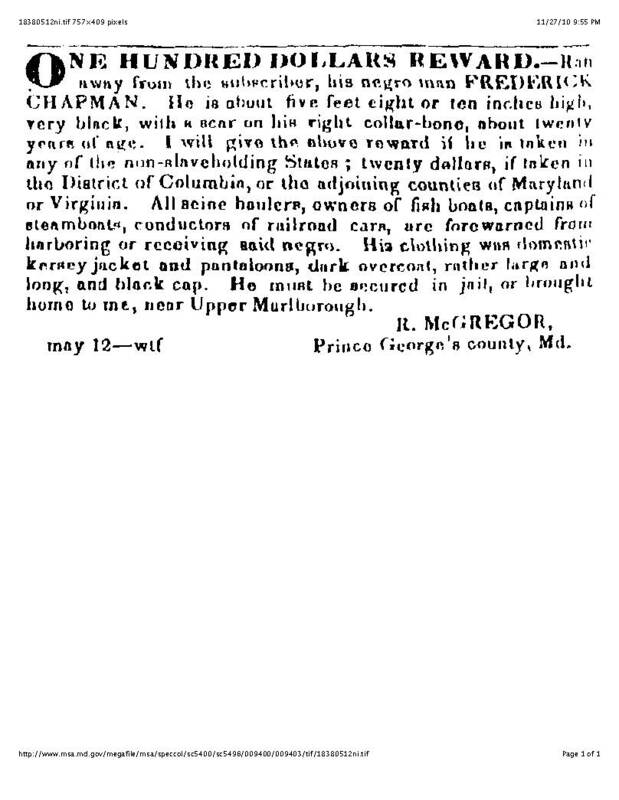 In May 1838, Frederick Chapman ran away from Roderick McGregor’s place in Upper Marlborough. He was first advertised on May 12. 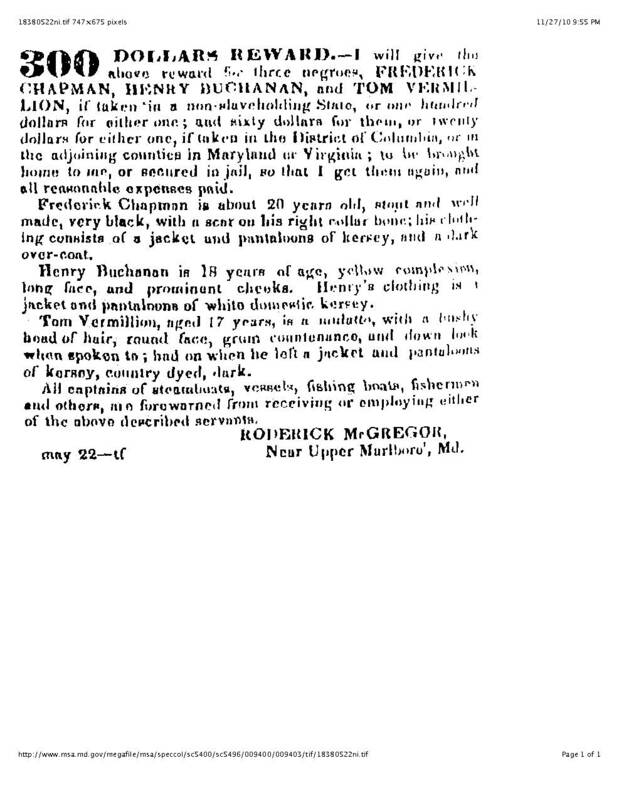 In a second ad, started May 22, Frederick is advertised with Henry Buchanan and Tom Vermillion. Either Frederick ran first and the others followed, or the others weren’t missed right away. Slaves working away from home were not always monitored closely. 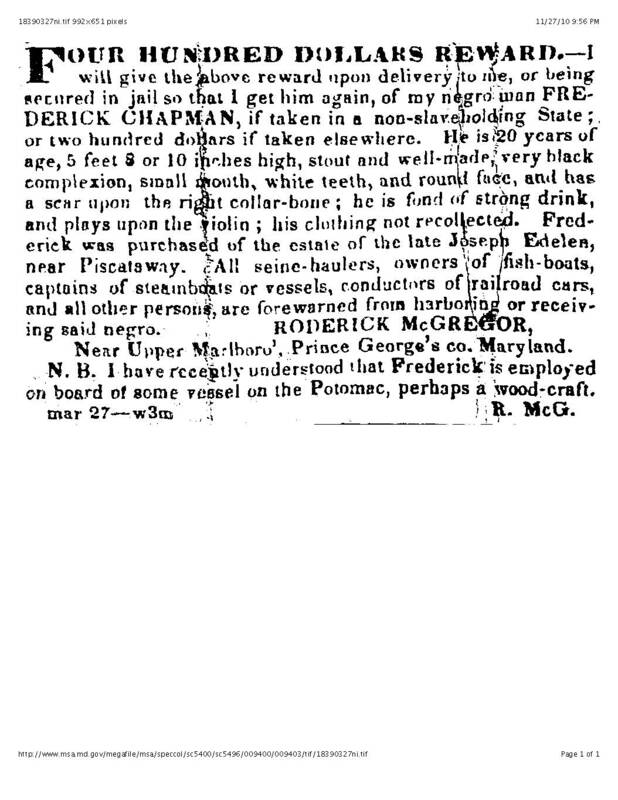 Frederick Chapman was advertised again on May 30, perhaps indicating that Henry and Tom had been caught. 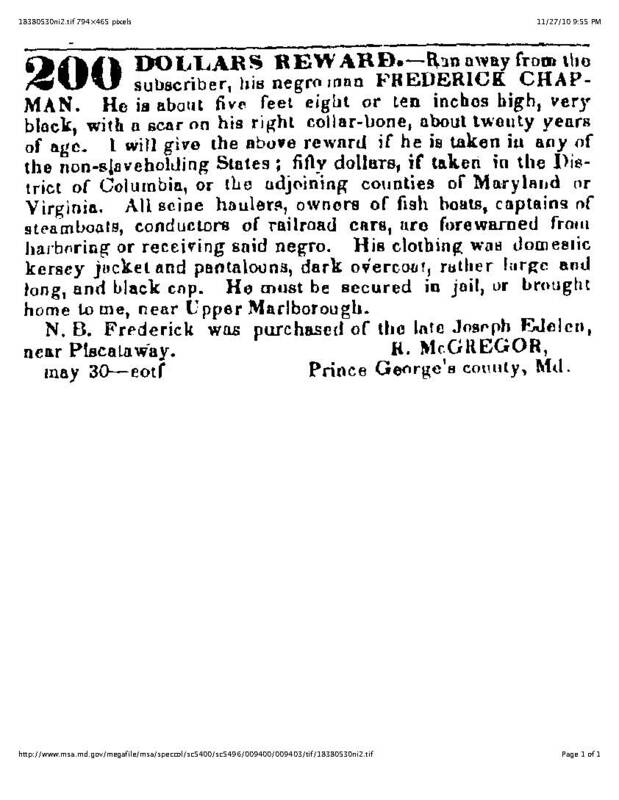 Frederick was advertised again almost a year later, when Roderick McGregor got some news about his possible whereabouts. There is no indication that Frederick Chapman was ever caught, though he could have been caught and then sold. He does not appear with the others in the 1858 inventory of Roderick’s estate. In November 1844, Tom Vermillion and Henry Buchanan ran away again, this time with Anthony Chase, Ned Dodson and Hanson Shaw. All these men were caught, and do appear in the 1858 inventory. 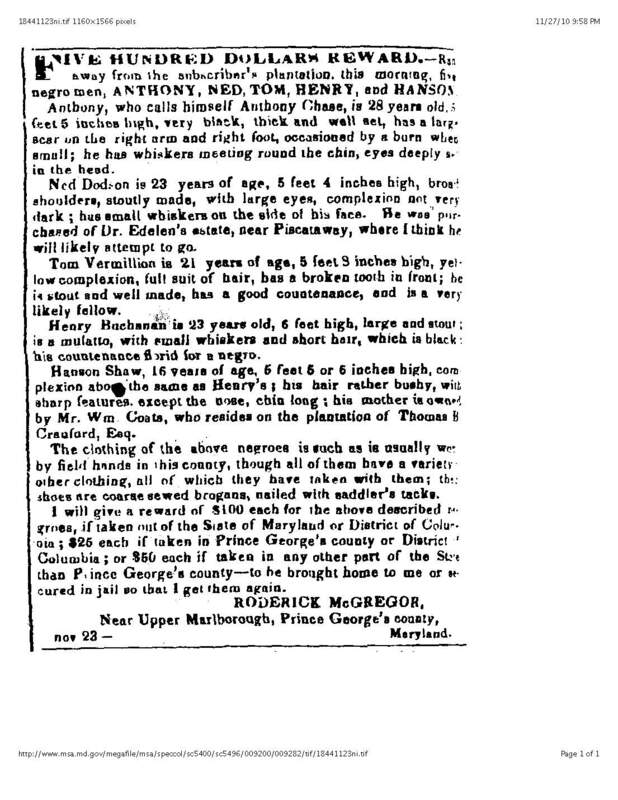 Roderick McGregor died in September, 1857, and on 29 December Jack Bowie ran away. This ad appeared on 9 January and later that month, according to a bill in the estate papers, Jack was advertised for sale. In 1862, after slavery was abolished in the District of Columbia, Joseph C. Willard and Henry E. Willard (owners of Willard’s Hotel) filed a petition for compensation for the loss of five slaves. Among them was Jack Bowie, described as “about twenty-seven years of age. Black. About five feet six inches in height generally healthy, but not so strong and stout as the others.” For more information about Jack Bowie, see William & Matilda Bowie page. 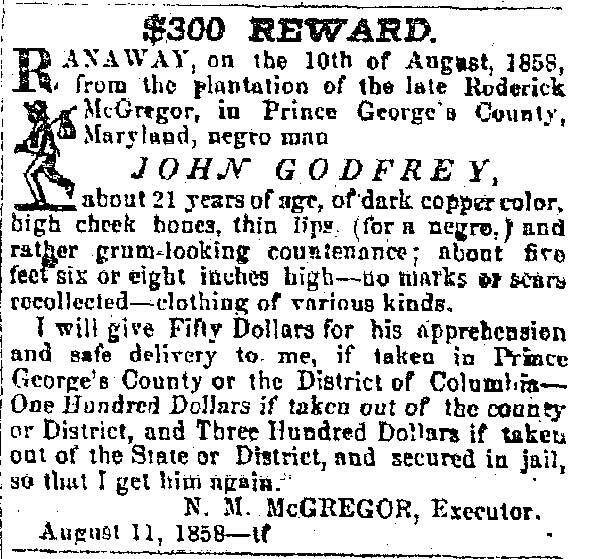 Eight months after Jack Bowie was advertised as a runaway, John Godfrey ran away, possibly also to avoid sale from the estate. Beneath the Underground: The Flight to Freedom, an Archives of Maryland Electronic Publication. Prince George’s County Case Studies, http://www.mdslavery.net/html/casestudies/pgcs.html, accessed 23 November 2011. Images are from Maryland State Archives, Special Collections (Newspapers), MSA SC 5400/5496. On the P.G. County Case Studies page, click on the name to reach links to a bio and sources. Click on Sources to reach images of the advertisements. Civil War Washington: Texts. Petition of Joseph C. Willard & Henry E. Willard, 19 May 1862. Civil War Washington ID: cww.00301. http://civilwardc.org/texts/petitions/cww.00301.html. A microfilm reproduction of the original document held at the National Archives and Records Administration, Microcopy 520, Reel 3. The original document is held in the Records of the Accounting Officers of the Department of the Treasury, 1775–1978, National Archives and Records Administration, Record Group 217.6.5. Within the National Archives’ Archival Description Catalog, see ARC Identifier 4644616 / MLR Number A1 347 (http://arcweb.archives.gov).